The St. John's defense showed off its depth Friday night against powerful Shepherd Hill. It was another wild week of high school football in the Heart of the Commonwealth, as several teams continued to flex their muscles early, while other programs are already looking for answers. Here's our look around the region. We've already talked about the Pioneers' big win at Shepherd Hill Friday night. St. John's scored 30 unanswered points in the game's final 17 minutes, and the Pioneer depth was on full display, as St. John's clearly had more left in the tank in the second half. "I think we just ran out of gas," Shepherd Hill coach Chris Lindstrom said of his team's second half performance. "They've got so many great players, that it's hard to keep them down for a full game." Lindstrom went on to say that he played his son Alec Lindstrom practically the entire game. St. John's didn't need to do the same with its top players. While junior Hunter Gorgas made an impact on both sides of the ball, St. John's has so much talent that most of its starters only play one way. That goes a long way toward staying fresh at the end of games, and St. John's may have the deepest roster, particularly in both trenches, in the region. Ok, so technically Northbridge lost last year on Turkey Day, but none of the starters were in as the Rams prepared for a state title game appearance. With that in mind, Friday night's 17-7 loss to Leicester was Northbridge's first loss in a competitive game since the state championship game in 2014. But the story wasn't about Northbridge, a team in the middle of a rebuild, it was about Leicester, a team potentially on the verge of some big things. The Wolverines bounced back from an opening week defeat against Auburn to best their old rivals from Northbridge, and did so riding the legs of senior quarterback Nate Powers, who broke free for a pair of touchdown runs. Powers has also proven to be a capable passer in the early goings of this season, and Leicester's defense enjoyed a big night as well. The Wolverines seem as poised as anybody in Division 4 Central to give favorite Littleton a run for their money. Ok, so Littleton never really went anywhere. They were undefeated last year until they ran into Cole McCubrey and West Boylston in the playoffs, but the Tigers have been near the top of the mountain for the last few years. Now, behind dual-threat quarterback Griffin Shoemaker, running back Anthony Rausa and a killer defense, Littleton appears to have the same kind of talent in had when it won a state championship back in 2013. Auburn, on the other hand, is growing back into the juggernaut it was a few years ago. In 2012, nobody could touch Auburn, as the Rockets rolled to a 13-0 record and Division 3 Central Super Bowl win. The win marked Auburn's fifth consecutive Super Bowl title, a run that saw the Rockets build a 41-game winning streak. But, since the MIAA switched to a state-wide playoff format in 2013, this Central Mass power has been re-tooling. It looks like the Rockets are ready for the big-time now, however, as senior quarterback Steve Saucier has allowed coach Jeff Cormier to open up the playbook, and the Rockets have scored 65 points in wins against Leicester and Tyngsboro. The Rockets have emerged as true contenders in Division 3 Central, but big games against Tantasqua, Uxbridge, Northbridge and Grafton will tell us much more about this team the rest of the way. The Mountaineers fell into an early 14-point hole against a suddenly explosive Fitchburg team, but rallied to score 35 unanswered points and win 35-19 on the road. Wachusett was powered by its offensive line and junior running back Cole Durkan, who rushed for three touchdowns. The Mountaineer defense also found its footing, shutting Fitchburg down after a pair of early miscues. The Wachusett defense is also playing without senior linebacker Connor Dubzinski, who is out for at least four weeks with a fracture in his foot. With a senior leader out, you can forgive the slow start, but Wachusett showed great resilience on both sides of the ball, scoring a big road win, and setting itself up nicely for a murderous rest of the season. The Mountaineers play Shepherd Hill, Leominster, Doherty, St. John's and Algonquin the next five weeks. That would be tough for any team, but Wachusett seems built to handle it. We had a full story on Algonquin's big win over Marlboro, but I just want to say how impressed I've been with the T-Hawk defense so far. Coming into the year, I expected this to be an offensive team, led by veteran quarterback Ryan Berry, and a number of talented skill players. While those guys have played well, Algonquin's defense has stolen the show, and done so by absolutely shutting down opposing run games. 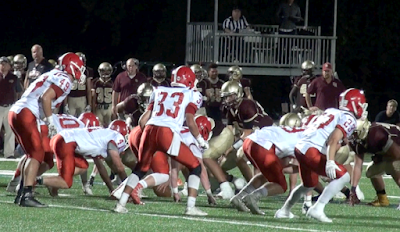 The T-Hawks stonewalled powerful Nashoba on opening weekend, and did a number on a very good Marlboro offensive line Friday night. Division 2 Central is crowded, but Algonquin has now shown it has both an offense and a defense that can play with anybody. -Nashoba bounced back from an opening night loss to Algonquin by topping Shrewsbury 24-0. The Chieftains are breaking in a lot of new pieces, but they've still got talent and size. It was just a matter of time before they got things figured out and again became one of the region's best teams. -Ifeatu Melifonwu's Grafton Indians won a big game against former coach Mike Ross, and UMass commit Cole McCubrey's West Boylston Lions. This Grafton team has to be considered one of the favorites in D3 Central, but I'd expect West Boylston to bounce back pretty quickly. -Chris Schoen has proven to be a quick study at Doherty. Only a sophomore, Schoen has grabbed the starting quarterback position, and put on a show at Foley Stadium Friday night, throwing for three touchdowns in a thrilling win against Holy Name. With weapons like senior receiver J.J. Early, junior tight end Phil Adarkwah and sophomore running back Tajon Vassar, this probably won't be Schoen's last big game this year. -Leominster is living and dying by big plays right now. Just a week after a highlight-filled win over Doherty, the Blue Devils emerged victorious against Oakmont, but gave up three different touchdowns of 46 yards or more, including a 97-yard run buy Oakmont's Anthony Dalbon. Leominster came out on top 30-20, thanks to another big game from sophomore running back Adam Couch, and the usual stellar play of senior quarterback Noah Gray (300 yards), but there has to be some concern about this veteran defense giving up so many splash plays. We'll learn more next week when the Blue Devils travel to face BC High, and stud running back Danny Abraham, who set a school record with 385 yards against Andover in the opener.